More than 100 Indian fishermen were arrested and 19 of their boats seized on Sunday by Pakistan for allegedly fishing in their territorial waters off Gujarat coast, Pakistani officials and a fishermen association in India said. Pakistan Maritime Security Agency arrested the fishermen and seized the boats off Jakhau coast in Kutch district. A PMSA spokesman confirmed that the fishermen and the boats had been handed over to the local police for further action. The fishermen would be presented in a court on Monday and from there the judicial magistrate would send them to jail as per the procedure, according to a police official. "We have become used to this routine now as these Indian fishermen get arrested illegally fishing in our waters every month or so," the official said. 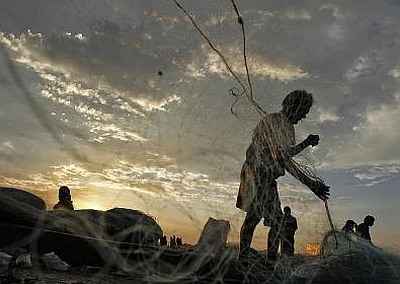 Earlier, India's National Fishworkers' Forum secretary Manish Lodhari said, "We have learnt that more than 100 fishermen who were on board around 18 fishing boats were apprehended by the PMSA near the international maritime boundary line off Jakhau coast on Saturday." "The fishermen who escaped (the arrest) have informed us about this," he said. The PMSA had earlier this month also apprehended 115 fishermen and seized 19 boats. This development came after the Indian Coast Guard captured nine Pakistani nationals along with a fishing boat in the same area off Jakhau coast on Friday. In March, the PMSA has in separate incidents arrested nearly 225 fishermen along with three dozen boats, according to Lodhari. Last month, the BSF had apprehended four abandoned Pakistani fishing boats near Sir Creek in Kutch district, while on January 27, the Pakistani maritime agency had arrested 60 Indian fishermen and seized 10 boats. Fishermen from both countries are arrested frequently for inadvertently trespassing into each other's waters. However, at times India and Pakistan have released them as a goodwill gesture to the other country. On January 5, some 219 Indian fishermen were released by Pakistan after 220 of them were released on December 25 last year. What reality will replace the dream of 1947?